NIOSH approved North Frontier™ Series are low cost and worry free units designed specifically for use in non-fire emergency situations, industrial safety, egress from a contaminated area, or for clean up of chemical/toxic spills and accidents. 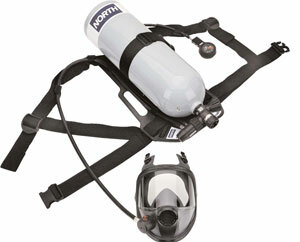 It is an self-contained, open circuit, compressed-air breathing apparatus (SCBA) consisting of a harness assembly with first stage reducer, pressure gauge & whistle, a cylinder, demand valve and a tight fitting facepiece. During use a positive pressure is maintained within the facepiece preventing any inward leakage of contaminated air..
For Specifications, please refer to the Frontier Series Technical Data Sheet. Gives the user unsurpassed protection and ensures greater worker acceptance. Common facepiece design to the 7600 Series air-purifying respirator reduces fit testing costs and user training. Substantially reduces repair costs, possible malfunction and assures user of a supply of air as long as there is air in the cylinder. Eliminates the error of using SCBA in a demand mode, reduces possibility of malfunction and assures user of a supply of air as long as there is air in the cylinder. Provides user comfort and ease of adjustment. Lightweight design distributes weight over a large area for added comfort. Approved for entry and escape from IDLH atmospheres. Positioned in an easy to read position. Positioned for ease of use. Rugged and dependable. To meet OSHA requirements. North products are covered by and subject to the terms and conditions of the North Safety Products Limited Warranty. Currently listed as 3 years form date of shipment from North.